Unforgettable 10-days in an awesome North Shore beachfront house. 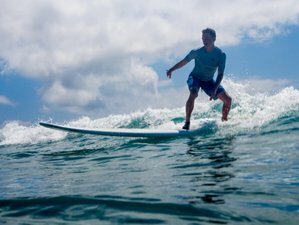 Improve your surfing, relax in a hammock, practice yoga, taste healthy delicious food, and enjoy fun activities, exciting excursions, and adventures around the island of Oahu. All while creating lifelong memories in a small group of like-minded people while you surf away all your worries in a tropical paradise. A great adventure for everyone who is looking for an all-around complete experience. Created to improve your surfing and style whether you are a novice, intermediate or advanced surfer. Our accommodation is equipped with a full kitchen for you to use, free Wi-Fi, and of course all the bathroom equipment even outside showers. During this trip, your surfing home break will be Puaena Point at Haleiwa and Chun's Reef on the North Shore or Diamond Head at the South Shore depending on the conditions. Apart from focusing o surfing, there will be yoga classes for you to join to build strength, balance, and flexibility in which any surfer will tell you that those are key elements in surfing. Pata Sudaka wants you to improve your surf level and style as well as your overall health, and this trip offers a unique chance for you to do just that by maximizing the benefits of combining surfing and yoga. This surf trip is suitable for you if you have never surfed before but you love the ocean, if you have surfing experience but you want to improve your surfing technique and style, or if you want to learn how to read the ocean to catch better waves. Enjoying the real simple surfing lifestyle, outdoor adventures, and beautiful landscapes. It is important that you know how to swim. Your itinerary during this surf camp doesn’t mean that you need to follow it. You can surf any time you want. The schedule may also change depending on the weather and surf conditions. A typical day consists of breakfast served around 7:00 and 8:00, followed by a surf training and later on a surf lesson or a free surf session. Lunch around 1:00 pm, and afternoons filled with adventures such as hikes, snorkeling, SUP on the river. We have all the best adventures prepared just for you! Dinner are evenings are your time to relax, cook at the house or head out to a local restaurant to try new flavors. Oahu offers endless activities for you to enjoy. Pata Sudaka will make sure you do not miss out on any remarkable places (usually hidden from tourists) by taking you to each and every side of the island with professional tour guides. Giving you the opportunity to experience the real Hawaiian life with sighting craters, lookouts, secret beaches, traditional towns, hikes, marine wildlife and more. Showing you all the best spots, telling you ancient Hawaiian stories, taking you to the macadamia nut farm to indulge on local products, taking you to jump off a cliff if the conditions allow (and you dare to), and finally the experience of a lifetime - snorkeling with the Hawaiian green sea turtle or dolphins. Oahu is known as the "gathering place", and the island is the third largest island of the Hawaiian chain. You will learn to ride waves at the very place where surfing was born. Surfing is just a way of life in Oahu, there are over 100 named surf spots surrounding the island. The island waters are crystal clear, it is perfect for snorkeling session all-year around. The surf on Oahu can go from two feet to eight feet in the south and from two feet to 60 feet at North Shore. Pata Sudaka will take you to spots where you can surf beginner friendly but fun waves, with the option for the more advanced surfer to paddle out to bigger surf at the back. The south shore of the island is the most touristy side but if you know where to go you can find great places like Kapiolani Park and Diamond Head. The north shore is famous for the good waves and the epic snorkeling. The west side of Oahu is the driest but has the most beautiful beaches. Pata Sudaka will take you to explore all these exciting and diverse places of the island. Included are breakfast and lunches, plus a special last day BBQ farewell party! Treating you to the best local and international food. Imagine foods with a great variety in colors, flavors and nutrition filled superfoods because we know you’ll need the power to keep up with all of our prepared adventures! We also care about your unique dietary requirements whether you are pescatarian, veggie or intolerant to certain foods. Just let us know! Dinners can be cooked on your own (we will take you grocery shopping to make sure you have all that you need) or you can join the team to try some new flavors in a local restaurant. Please book your flight to arrive at Honolulu International Airport (HNL). Transport from and to the airport is included. Airport: Honolulu International Airport Airport transfer included: Honolulu International Airport No additional charges. You can request this in the next step. Pata Sudaka Surf Camp Adventures has everything you need to make perfect your visit thru Hawaii, surf lesson, yoga, exclusive cuisine, and workshops.